This interesting name is of Anglo-Saxon origin, and is locational from any of the various places so called in Herefordshire, Nottinghamshire, Shropshire and Staffordshire. The name derives from the Middle English "hay", a development of the Olde English pre 7th Century "gehaeg" or "hege", meaning "enclosure", plus "wude", wood, hence "enclosed wood". It was a common practice in the Middle Ages for areas of woodland to be fenced off as hunting grounds for the nobility. 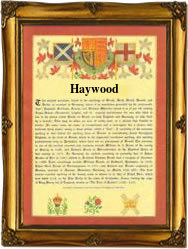 Great and Little Haywood in Staffordshire were recorded as "Haiwode" in the Domesday Book of 1086, and as "Heywode" in 1279. The surname was first recorded at the end of the 12th Century (see below). One Adam de Heyuuode appears as a witness in the Assize Court Rolls for Lancashire in 1246. John Haywood married Joane Tynnyswoode on May 15th 1547, in St. Mary Magdalene, Old Fish Street, London. The first recorded spelling of the family name is shown to be that of Anselm de Haiwod, which was dated circa 1199, in the "Chartulary of the Priory of St. Thomas the Martyr", Staffordshire, during the reign of King Richard 1, known as "The Lionheart", 1189 - 1199. Surnames became necessary when governments introduced personal taxation. In England this was known as Poll Tax. Throughout the centuries, surnames in every country have continued to "develop" often leading to astonishing variants of the original spelling.